Been a grey winter. Lots of fires, lots of wood burnt! We started the winter with six stacks. Admittedly, four of them were almost entirely of weeping willow – and that’s very light and burns quickly. We could get through a whole barrow-load in an evening, so it is not surprising that we used a lot of wood, in volume terms. Here’s picture of the wood store on March 2nd. You can see the slatted back – there’s no more after this. But – and it’s a big but – all the wood left is really good wood so it lasts well and we get 3 or 4 fires out of a barrow-load. But we still have to get through to April. There is other wood, of course – but it’s earmarked for next winter and may not all be as dry as I’d like it to be. Burning damp wood is considered bad news. You don’t get as much heat out of it – perhaps obviously as the water has to be boiled out of it before it will burn – but almost worse is that you clag up the flue with tarry deposits. Up to now the sweep has been very pleased with us – all he gets out is a small quantity of dust. (Curious to be pleased to be praised by one’s sweep!) And so we know that the wood we’ve been burning is dry. 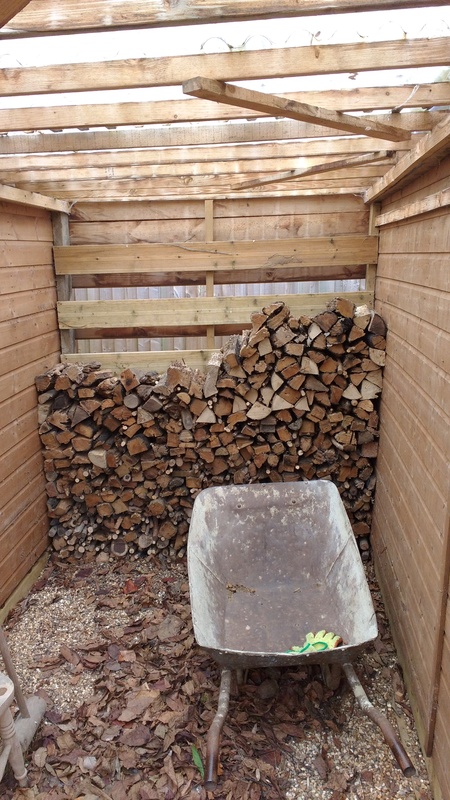 The wood store is the gap between two sheds, about 1.5m wide with a light corrugated plastic roof and a slatted back so that the wind can blow through but not the rain. It seems to work OK. The ground is gravel (plus the inevitable leaves which blow in) so even the bottom layer doesn’t get too wet from the ground. We find the remnants of the odd mouse or bird nest as the winter progresses – empty, fortunately! As described elsewhere in this occasional blog, the house has tiled floors – so we just wheel the barrow into the house. What? Take a wheel barrow into the house!? Well, why not? There may be a slightly muddy wheel track but not much because the route from wood shed to fire is all gravel or paving. Just make sure you don’t hit the walls or doorways. This entry was posted in Log burner. Bookmark the permalink.